Creativity in all it's engaging guises but presented with a new technology and social media twist! I really can't remember how I stumbled across this idea of writing super short Tweet size stories. I certainly didn't originate it - yet when I searched the hashtag I found an assortment of fits and starts with a challenge to write a short story in the form of a Tweet - and I was intrigued! I guess it's sorta related to the Tweet Me a Book Review idea I had and blogged about a few years ago with it's accompanying Wikispaces lesson page. The activity is below is copied from my Wikispaces page where, at the bottom of the page, I uploaded for you the doublesided paper PDF version for practice or when you want that social media engagement but you can't get to or have the machines. 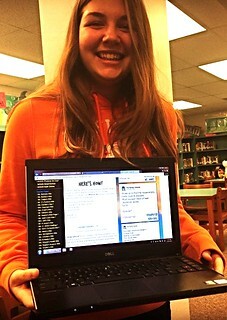 The Wikispaces version of the lesson features a java script character counter widget and a Google form to submit the story. 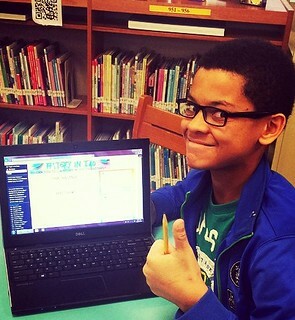 A good portion of my kiddos are under 13 and I wouldn't want them to use Twitter directly, I'll be the Tweet conduit. I did this activity with 7th grade ELA classes right before the holidays & splurged for a couple hundred blank white and brightly coloured bookmarks from Amazon so they could write the story up & decorate it for fun! 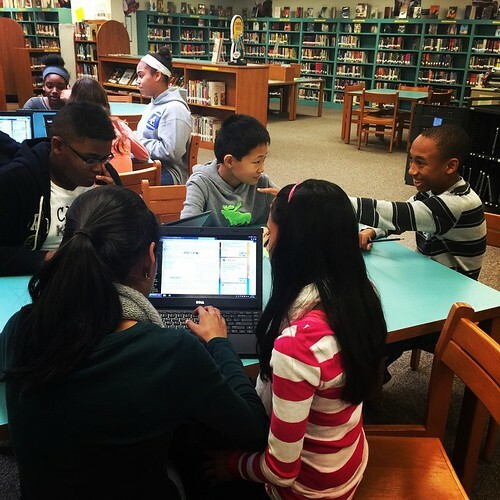 While they were creating their stories I took pictures with my new Daring Librarian Instagram account letting the kids tag themselves in they wished to and I even took a Vine of a couple of my kids rapping their story posted below! Can you tell a story in 140 characters? The size of the average Tweet? This literary challenge requires you to write a super short story that includes a main character, a problem, an event, & intrigue. Try it! 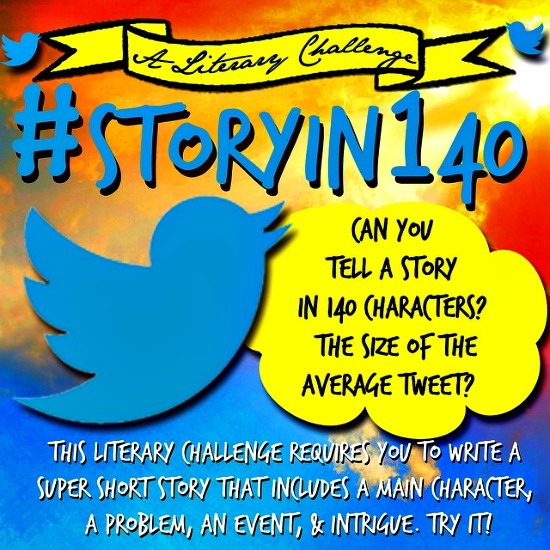 Please note: if you add the hashtag #Storyin140 the total will actually be 130, but Story in 130 didn’t rhyme! More examples of student work below. Brainstorm with the character counter generator embedded below on the left. Just type in what you're thinking then hit-calculate characters. 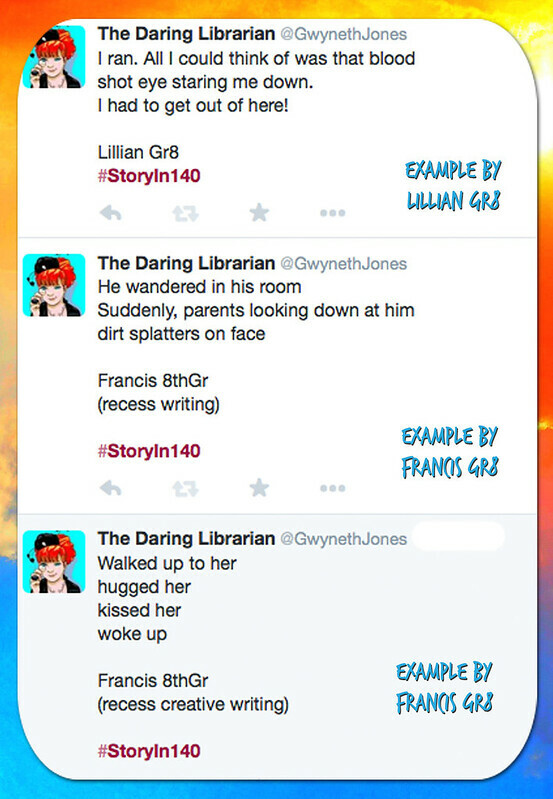 Don't forget to add #StoryIn140 hashtag to your creation & your first name, last initial, & grade. Writer's Block? Are you stumped? Can't think of anything? Try working in a pair to brainstorm a story. Think of it as an Madlib. Who was where, did what, what happened, & intrigue! Intrigue means here, to inspire curiosity or to fascinate. To make the reader think: What's going to happen next? Extra Challenge: If you leave a few extra characters (total 125-130) then you have more chance for people to RT (or re-Tweet) your story, passing it along to the world. We will be selecting via gallery walk, the best for special recognition, fame, glory, possible lamination, display, and Tweeting them out to the world! Submit the Final draft in the Google Form: Don’t forget the hashtag #StoryIn140 Your full name will NOT be used just your first & your grade. Non-MHMS students will be deleted. 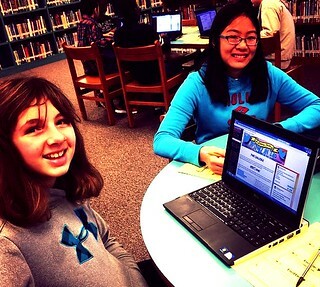 View the whole thing at my #StoryIn140 Wikispaces page! Why not write a collaborative story via Twitter with your own hashtag? Announce you'll post the next "chapter" on a certain day and at a certain time? This was the very idea that inspired Jennifer Egan’s “Black Box,” a short story tweeted line by line by The New Yorker’s fiction account featured in the Ted Talk below. I've also seen some cool historic and literary Twitter accounts that Tweet in persona. Much like the idea of Fakebook I blogged about years ago. Creativity in all it's engaging guises but presented with a new Technology and social media twist! Suggestions? Additions? I'd love to hear them in the comments! WOW, thanks Julie! Coming from you that's high praise! We are totally stealing this idea, Ms. Daring! Thanks for the inspiration! There is no stealing, my dear friend Mary - when I give it to you freely! All Hail Creative Commons! Great idea. I am thinking that I will try to see if my book club students can write a book review in this way.